I wrote earlier about the Triquetra Amulet and Earrings: simply meaning “triangle”; Triquetra refers to a variety of three-cornered shapes and evolved into a symbol of depth. This Celtic three cornered knot represents three-in-one: the Trinity. To augment the Triquetra Knot I have added a woven circle: The Unity of the Trinity, the Circle of Love unifies all. 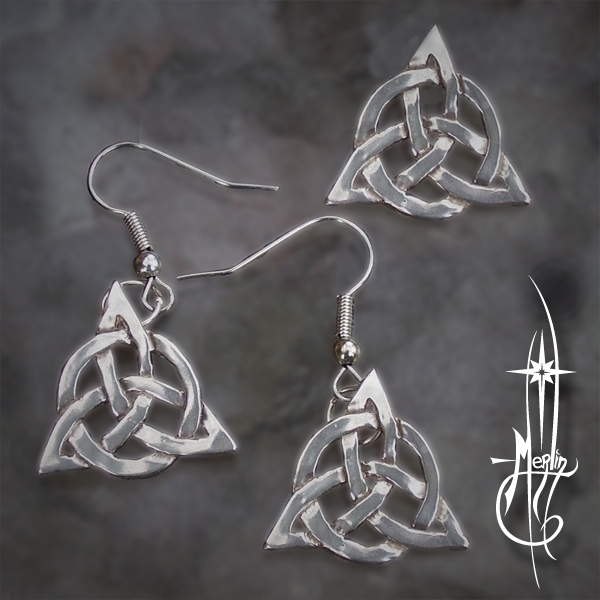 To combine the Amulet with matching earrings, I have created: the Merlin’s Triquetra Collection. Now you may order the entire set and added the option of your desired length of chain. The Triquetra Collection are for those who cherish what the idea of the Trinity in any of its forms: The love of family, their religion, the earth itself, or simply find the shape of the triangle pleasing to their eye. Triquetra simply means “triangle” and has been used to refer to a variety of three-cornered shapes but has been evolved into a symbol of depth. Often seen in the Book of Kells, some have surmised that because of its frequent use as ornamentation has been a part of folk lore pre-dating the creation of the ancient texts. It appears in stone and metal on crosses, markers, jewelry and other artifacts through-out Celtic history. Because of the Christian Influence and their lore concerning the Trinity, many have attributed the shape to represent: “The Father, Son and Holy Ghost”, but it could easily represent any lore that embraces the Three: Parents and child; the three phases of human existence: Youth, Middle Age and the Elderly; Maiden, Mother, Crone; Green Man, Hunter, Sage. All Threes: a number of Manifestation in Creation. In recent years it has been popularized within the Pagan and Wiccan communities, for they too love the manifestation of Three. It has even been embraced in the Television series “Charmed”; the Triquetra is embossed on the Grimoire of the Three Sisters. The Triquetra Amulet represents the Trinity, the manifestation of Three and the integrity of one purpose through love. 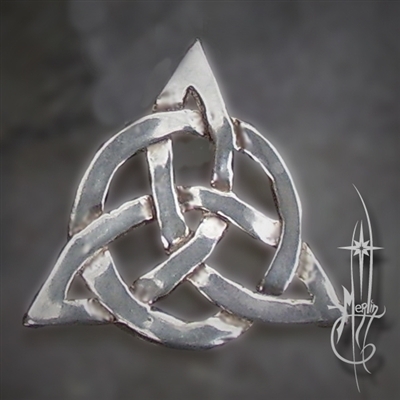 The Triquetra Amulet is for those who cherish the idea of the Trinity in its many forms.